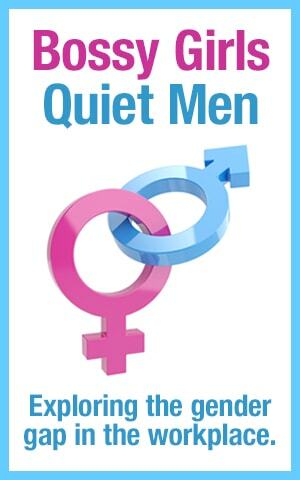 Bossy Girls and Quiet Men? I’m not counting, but my first blog on Little Miss Bossy had a lot of hits and likes. (Okay, so maybe I was counting.) I posted it on my Facebook® page, and got a lot of ‘likes,’ too. But something struck me as odd. Not one of my ‘likes’ was from a man. Not one. My husband is off the hook because he’s not on Facebook, but my father and brother are in hot (well, maybe tepid) water. Why didn’t any of my male friends or family click the ‘like’ button for my blog? I think, when it comes to woman in the workplace and the appropriate response and action from men, many probably feel like my husband did that day. You don’t want to say the wrong thing and risk sounding sexist and demeaning, so all too often, men remain silent. It’s not altogether surprising that men would choose this path, after all, office politics are complicated, especially when it comes to sensitive topics like sexism and discrimination. Turns out, there’s a huge disconnect between the sexes in the workplace. In the book ‘Work With Me: The 8 Blind Spots Between Men and Women in Business,’ authors John Gray and Barbara Annis surveyed over 100,000 employees across 60 organizations, and found that a whopping 82 percent of women feel some form of exclusion in the workplace, while 92 percent of men don’t believe they exclude women at all. And this disconnect in the workplace has a negative effect. It often leads to frustration, mistrust, resentment and miscommunication. According to Gray and Annis, men often walk on eggshells in the office to avoid offending women, and this can cause women to misinterpret men. But according to the authors, when we increase understanding between the sexes you’ll see a boost in productivity, morale, and organizational effectiveness. So where do we go from here? How can we increase understanding between the sexes and eliminate feelings of exclusion? Surely, a good starting point is to create awareness. And maybe the 82 percent of women that feel excluded need to have an open dialogue with the 92 percent of men that don’t think they exclude women at all. Again, it comes back to ‘leaning in’ and whether or not women feel comfortable to do so. Men can play a huge part in the process by making women feel included in the workplace through their actions and words. At the very least, if you are a man, make sure you click the ‘like’ button and let me know you enjoyed reading this blog. I’m counting this time.